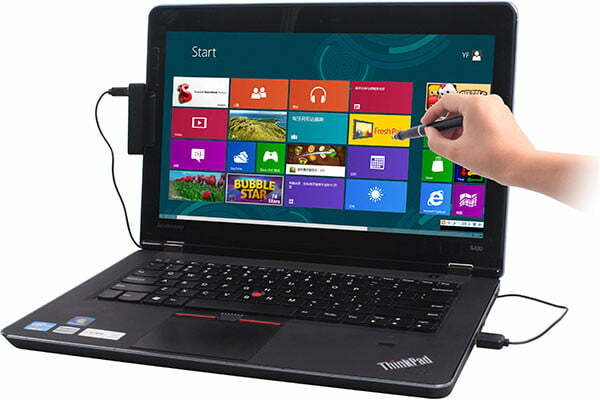 While CES has featured plenty of top-of-the-line touchscreen computers – from the convertible Asus Transformer Book to the Sony Vaio T14 and T15 – the truth remains that most users will not be able, or willing, to upgrade to a touch-enabled device immediately, especially if they’re still wary about the future of Windows 8. That’s where the new eFun aPen Touch8 comes in. Thanks to infrared, ultrasonic technology, this digital pen peripheral adds compatibility for simple gesture-based features, even on non-touchscreen machines. The plug-and-play aPen Touch8 does not require any drivers. Instead, simply plug the included receiver into a USB port, clip it to the side of your monitor, adjust the configuration under “Tablet PC Settings,” and go. The receiver itself, a black box slightly larger than a stick of gum, is relatively low-profile, while the pen itself is wireless, with up to 500 hours of battery life. A stylish, office-executive design adds pizazz, while the tip takes the form of a thick, stubby paintbrush rather than a stylus point, presumably to help avoid screen smudges and scratches. While still no substitute for 10-point touch sensitivity, the $80 aPen Touch8 represents a potential compromise for those intrigued by Windows 8, but who aren’t yet ready to invest in a dedicated touch machine. The peripheral should be available within a month or two, but keep in mind that it can only support up to a 17” screen.